So, did ya feel it? No? Tonight we here in Southern California had another reminder that we live in Earthquake Country. At 8:39 p.m. a little 4.7 shaker hit the Los Angeles area and there have been a couple smaller aftershocks since then. 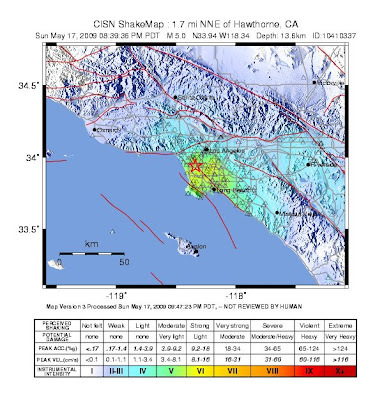 This one, which apparently was located on the northern/western tip of the Newport-Inglewood Fault, was felt throughout the Southern California area and, according to news reports very late Sunday night, has resulted in very little damage. Here in Costa Mesa it was a jolt, then some jiggling - enough so that we moved to a doorway for the duration of the 8-10 second tremor. Here's a map from the USGS site - one of many available for viewing for each such shaker. I've provided a link over on the right side of this page for that site for future reference. THE BIG ONE - FICTION OR PREDICTION? Just for reference, shortly after Hurricane Katrina I wrote an essay on my other blog site which addressed a potential big shaker on the Newport-Inglewood Fault. You may find it of interest. It can be read HERE. So, life goes on here in "shaky land".